Hints of some of Brenda and Wade Brickhouse’s passions greet visitors to the couple’s house in Chattanooga, Tennessee. Two dogs and two cats call the place home. Pottery from North Carolina’s Seagrove area shares space with fine crafts associated with the Penland School of Crafts, as well as with the works of other artists including Wade himself. And the house—set in the woods and actually surrounding one large tree—even suggests Brenda’s long career in environmental management. The couple’s unique NC State estate plans reflect those same interests. The Brickhouses have made thoughtful, generous bequests to the College of Natural Resources, College of Veterinary Medicine and Gregg Museum of Art & Design. That kind of variety has always been important to NC State alumna Brenda, who earned her bachelor’s degree in forestry in 1980. She enjoys pulling together disparate people, ideas and interests as vice president for environment for the Tennessee Valley Authority—where she channels that kind of collaboration into work that spans planning, policy, permitting and compliance in TVA’s seven-state region. Through jobs ranging from power plant manager to health and safety professional, Brenda has been “lucky, or crazy, to move around a good bit.” But despite living in more than half a dozen towns in four states, she maintained close ties to NC State—often combining vacation travel with volunteer service. After having served as the first female member of the board of the North Carolina Forestry Foundation, for example, she became the first board president for the NC State Natural Resources Foundation. Providing financial support for the university proved a growing priority for Brenda and Wade. Working closely with CNR’s development officers over the years facilitated our thinking about the opportunities to leave a real legacy and provide for things we care about. One of those things clearly is CNR, where the Brickhouses’ bequest will provide unrestricted funds to help college leaders respond to evolving opportunities and challenges—a need Brenda recognized through her service. Their planned gifts to NC State make sense to the Brickhouses in many other ways. Wade grew up in Raleigh, which is where the couple began their life together. He remembers being introduced to the university in the 1950s when his brother was enrolled. “We played basketball in Reynolds [Coliseum] and went to football games, and he took me on a tour of the nuclear reactor,” Wade said. Later, the College of Veterinary Medicine provided exemplary care when one of Wade’s dogs suffered a back injury; the couple’s bequest to CVM will support care for companion animals whose owners may be unable to afford it. Wade already has gifted some of his own paintings to CVM’s art collection. His diverse work—which also includes printmaking, paper sculpture, clay, glass and metal—often derives images and forms from ideas about home and boats, shaped by Piedmont and eastern North Carolina. Both Brickhouses have become appreciative and knowledgeable collectors, regularly purchasing fine crafts or artwork to mark holidays and personal occasions. “The only rule is that we both have to like it!” said Brenda. 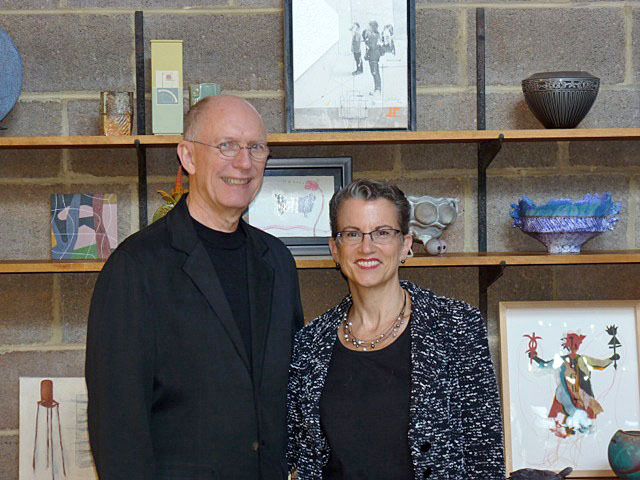 With so many ties to North Carolina, the couple finds it fitting that most of their sculptural and functional clay, glass, metal, photography and works on paper eventually will find a new home with the Gregg, along with funds to support the collection. Friends inspired Brenda’s interest in pottery while she was in high school, and that interest was nurtured during college, a time she recalls as the perfect mix. NC State’s large university setting offered many opportunities to attend arts and athletics events, while she enjoyed small classes—led by great professors and supplemented by hands-on internship, field course and summer camp experiences. Courses in design, environmental ethics, policy and political science led to a minor in environmental planning; that field became the focus of a master’s degree in public affairs completed in 1988 through NC State and the Institute of Government at UNC-Chapel Hill. Today, she counsels young people not to pigeonhole their interests, major or career plans too early, but to embrace a dynamic world of opportunities. With their thoughtful and varied planned gifts, the Brickhouses will ensure that NC State continues to accomplish something bigger, for a long time to come. Watching my brother’s success as a graduate, and then Brenda’s accomplishments, has made me very proud. If I have any regret in life, it would be that I did not attend NC State. Having this opportunity to support the university is all the more important to me, as I do it for my brother, Brenda and the leaders of the future who will come from State. I am very proud to be a part of this.